When you’re a mom, self-care often gets pushed to the bottom of your priority list. It’s not like we mean to do it really, but somewhere between the diaper changes and scraping food off of weird places– it happens. It’s hard to focus on yourself when you feel like you barely even have time to sit down for a meal. You’re a mom, and you’re busy. You don’t have a lot of time for self-care activities… I get it. But, thankfully, self-care doesn’t always have to take up a lot of your time to be effective. These self-care ideas for moms will only take you 30 minutes or less. Pampering yourself doesn’t have to mean taking an entire day to go to the spa. Let’s be real. 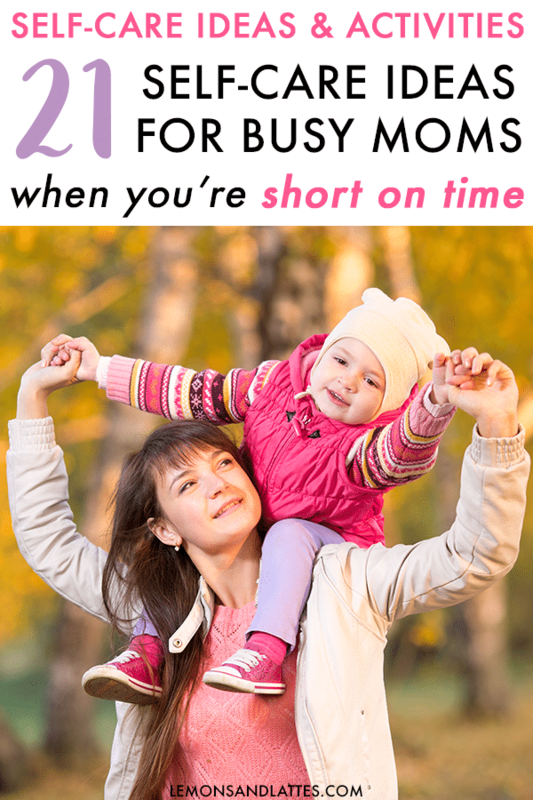 Busy mamas don’t typically have time for that. It can be as simple as treating yourself to some new pretty nail polish and painting your nails, hiding in the bathroom to give yourself a quick facial while the kids watch an episode of their favorite show, or simply deep conditioning your hair– Literally anything you’d like. Coloring isn’t just for kids. In fact, it’s the perfect stress reliever and self-care idea for moms looking for a creative outlet. All you need is a coloring book for adults, some coloring supplies, and you’re good to go. Next, I urge you to try to at least eat a healthy breakfast. I’ve found that eating a healthy breakfast really does set the tone for my day. Cooking up a healthy breakfast can be quick. Blend a quick green smoothie, try some overnight oats, or whip up a quick loaded veggie omelet. If you need more healthy meal ideas, this bundle can help you with that. Eat well, yes, but drinking more water is also something to strive for. An easy self-care idea you can try is to drink a glass of lemon water right when you wake up in the morning. It’s great for digestion and gives you a head start on your water intake for the day. Need a water bottle to stay on track? You’ll love this one! Going to bed at a decent hour is easier said than done if your kids are still little or you have a baby– But at least try to if you can. If you struggle to fall asleep fast, valerian root, diffusing a couple drops of essential oils for sleep, or avoiding bright screens right before bed may help you catch some z’s faster. Do you love pen and paper? Journaling can help with anxiety, stress, and depression (source)– Another fantastic self-care idea for moms. This journal with prompts is perfect for beginners or you can take the bullet journaling approach and start with a dotted journal like this– There are endless bullet journal ideas on Pinterest! Next– Having a glass of wine or cup of tea after the kids are in bed is the perfect way to relax, wind down, and de-stress from your day. Which tea blends are best for stress? I love this Yogi stress relief blend and the caramel bedtime blend! Did you know physical clutter can stress you out (source)? It’s time to start kicking the clutter, lady. That being said, decluttering can be an overwhelming task. An easy way to make it feel doable is to declutter ONE thing or one area at the time. Making a little progress as you go along will help snowball your motivation! Any time that I’m feeling particularly stressed or overwhelmed with things to do, I do a brain dump. 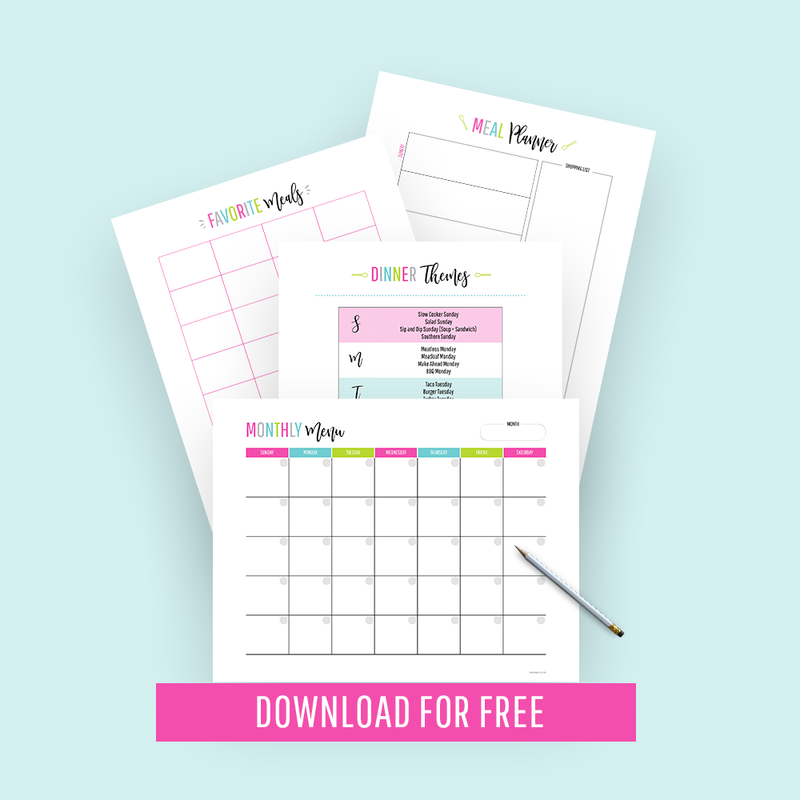 This post will show you how to clear your mind with a brain dump and you can snag a free brain dump template while you’re there. I’ve found that I feel much more positive, motivated, and happy when I’m working towards a personal goal. This can literally be anything! What do you day dream about? What would you LOVE to accomplish? Your goals and dreams matter. Nothing makes you feel like a million bucks faster than a quick shower. You know I’m right! P.S. Brownie points if you blow dry your hair and moisturize afterwards! I stopped buying music a while ago. Pandora (free version) is my BFF these days because I can listen to my favorite music fo’ free. Jamming out to your favorite music will almost always boost your mood and make you feel happier and more positive. The super simple and quick self-care idea I highly recommend to moms? Take a few deep breaths of fresh air. You can’t beat it! Go for a short walk, open a window, step outside for a few seconds– Do whatever you need to do in order to get those few gulps of fresh air. Do you wish there was a way to reduce stress, ease anxiety, and improve sleep? There is, and it’s as simple as squeezing in a quick workout. Exercising causes your body to release chemicals called endorphins. And you don’t have to spend an hour at the gym (ain’t nobody got time for that) to reap the benefits. There are countless free workout videos on YouTube you can try or (my favorite) strap the baby in the stroller and head outside or to the park! Every morning I take about 30-45 minutes before my kids wake up to sip my coffee, check my blog analytics, scroll Facebook, etc. Just getting those few extra minutes to yourself to do something you like can make ALL the difference. Another way I like to de-stress– Listen to ASMR on YouTube. It might sound strange at first, but it can be extremely relaxing. There’s a reason they say laughter is the best medicine. According to this Forbes article, laughter releases endorphins and has an effect similar to antidepressants. This can be fictional or not– Anything you find uplifting or inspiring. As moms, something we often forget that no is indeed an option. If you have a lot on your plate and you don’t want to do a particular thing, it’s 100% okay to say no! We spend a lot of our spare time scrolling Facebook or Instagram, and sometimes… it can be toxic. Does seeing a certain person’s posts make you feel less than amazing? Hit that unfollow button! You are in control of your life. If something makes you feel bad, you can kick it out of your bubble. Finally, ask for help when you need help! Just because we’re moms doesn’t mean we’re not allowed to ask for help. If you’re feeling completely frazzled, it’s completely acceptable to speak up. Now, I’d love to hear form you! Have you tried any of these? 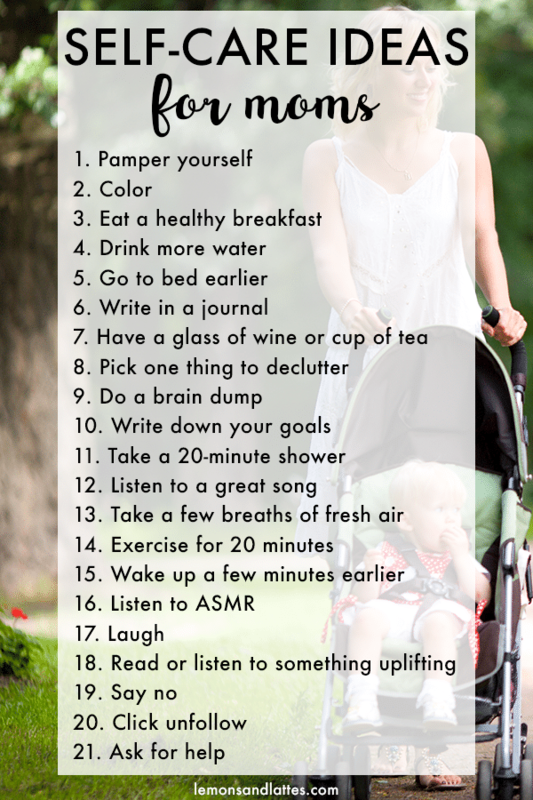 What are your favorite quick self-care activities for mothers?